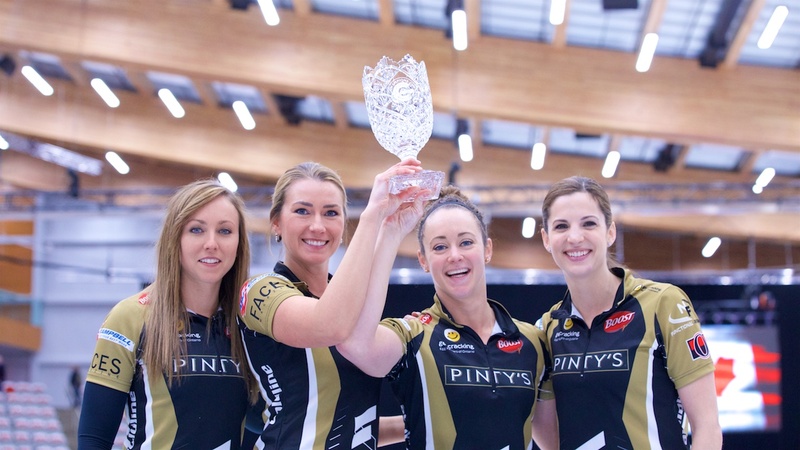 Ottawa's Rachel Homan, Emma Miskew, Joanne Courtney and Lisa Weagle (Photo by Anil Mungal) finish off the 2017/18 season with a win at the Humpty's Champions Cup in Calgary. CALGARY - Rachel Homan (Ottawa, ON) wins the Humpty's Champions Cup, defeating Kerri Einarson (Winnipeg, MB) 7-6Homan with Emma Miskew at third, Joanne Courtney and Lisa Weagle on the front end take home the $40,000CDN first place cheque along with 75.041 world ranking points, while Einarson receives $29,000CDN and 58.961 world ranking points for their second place finish. Starting with hammer, Einarson scored 1 in the first end, with Homan responding in the second end scoring 3. Einarson scored 2 in the third end to tie the game, then forced Homan to a single in the fourth. Einarson scored 2 in the fifth end to take back the lead, then forced Homan to a single in the sixth end. For Einarson, a tough 7th saw them give up a steal of 2 in the seventh end to Homan who held on for the 7-6 win in the final end. In the semifinals, Homan defeated Eve Muirhead (Perth, Scotland) 9-6 and Einarson defeated Jennifer Jones (Winnipeg, MB) 6-4. Muirhead and Jones earned $12,000CDN and 45.561 ranking points for their semifinal finishes. In the quarterfinals, Homan defeated Jamie Sinclair (Blaine, USA) 6-3, Einarson defeated Chelsea Carey (Calgary, AB) 5-3, while Muirhead defeated Anna Hasselborg (Sundbyberg, Sweden) 4-3 and Jones defeated Silvana Tirinzoni (Aarau, Switzerland) 6-5. Hasselborg, Sinclair, Tirinzoni and Carey earned $8,000CDN along with 32.161 ranking points for their quarterfinal finishes. Homan went 2-2 in the 15 team round-robin pools qualifying round. In their opening game, Homan lost 5-4 to Sinclair, then responded with a 5-2 win over Binia Feltscher (Flims, SUI), losing their next game to Hasselborg 6-2. Homan posted a 6-4 win over Kristen MacDiarmid (Halifax, NS) to advance to a tiebreaker, then won against Alina Paetz (Zurich, SUI) 8-7 to book their spot in the quarterfinals.